How we create and manage our energy resources will determine our quality of life. From battling greenhouse gases and developing electric car technology to ensuring that nuclear reactors around the world are running safely and efficiently, our world renowned researchers lead the charge towards cleaner, safer, and more innovative energy sources and technologies. Challenges: Reducing wasted energy, limiting pollutants from energy production and use, reusing, safely disposing energy by-products. Opportunities: Renewable energy sources, such as wind, solar and biofuels. Complex Interdependent Networks & Systems Simulation; Data-driven Models; Systemic Risk & Resilience Quantification; Performance Prediction under Multi-hazard Scenarios. McMaster’s John Luxat, a highly regarded Professor of Engineering Physics, has been selected to lead an international academy that fosters the safe and economic use of nuclear energy around the world. Six McMaster researchers have been awarded more than $1.9 million combined for infrastructure funding from the Canada Foundation for Innovation (CFI). 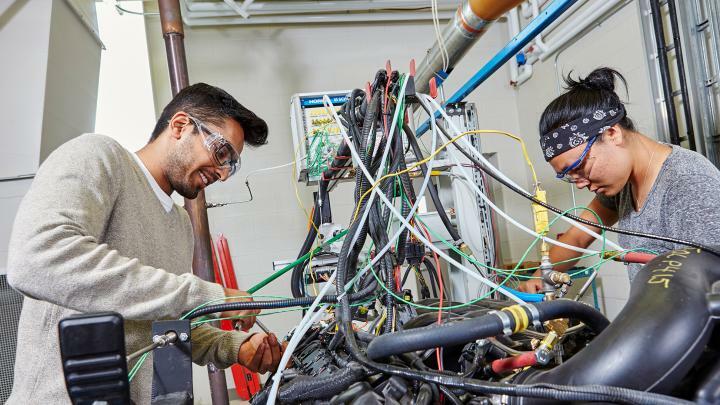 A new McMaster University start-up company has plans to produce ‘game changing’ technology to make the next generation of vehicles more efficient and affordable. Dr. Qiyin Fang will develop technology to monitor older patients living with chronic diseases. A successful first Research Information Night! Erinn van Wynsberghe, Eng Phys ’14, was awarded gold at the Innovation Factory’s “Innovation Night”. Four Engineering Physics Graduate Students win the Grand Prize! Congrats James, Kendall, Garik and Ken! David Hummel wins Best Paper Award in Finland. Another achievement for Dr. Luxat!